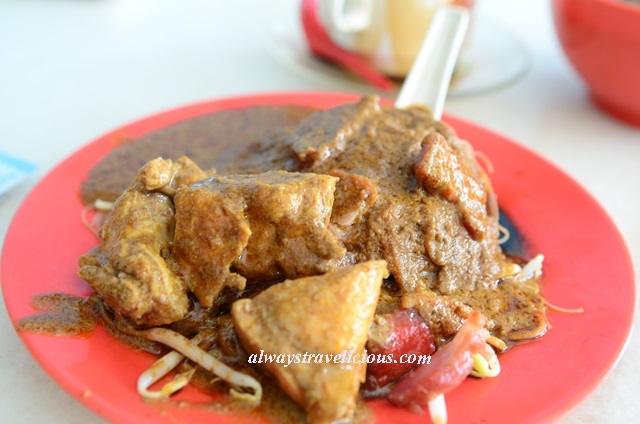 Yee Fatt Curry Mee @ Ipoh, Malaysia - Always Travelicious ! 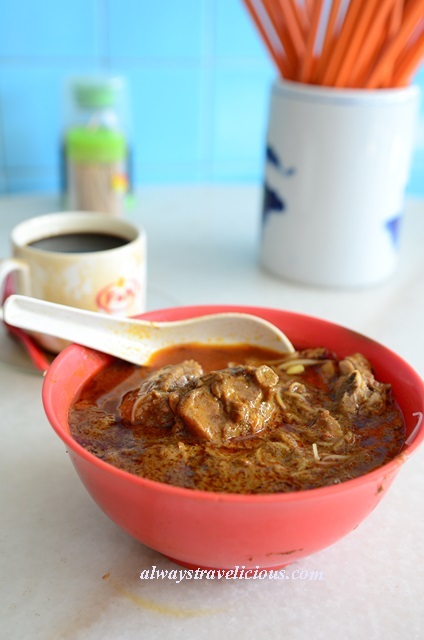 Yee Fatt’s curry mee （怡發咖喱麵）does not stinge on its spices used for its famed, piquant curry that’s been around in Ipoh for tens of years. Before you even enter Yee Fatt , the whiff of multitude of spices will lure you into the kopitiam without further ado. It’s like walking into a mamak shop but the intensity of curry scent is even stronger than that; strong enough I think after eating at the place, even my clothes might have caught a bit of the curry scent. Two types of curries are available here – the dry curry and the soupy curry. There’s a poster on the wall that showcases the two types of curries but let’s just say that’s only for illustration purposes. Looking nothing like how it was portrayed on the wall; there were no garnishes, no presentation; just a big scoop of curry paste dunked on the noodles with soy sauce; but who cares about all these things when the dry curry mee was smothered to death with a rich, creamy curry paste you could feel a serenade of spices dancing on your tongue. The curry coated on every strand of noodle, making every bite a gratifying one. As we worked our way through the curry, the bean sprouts and roast pork (char siew) were all hiding beneath the abundant curry. The soupy version served in a bowl was similar to the dry curry in terms of flavor, only a tad toned down. Calling it soupy might be misleading, because it was only soupier in comparison with the dry curry, but still rather viscous. Other dishes at Yee Fatt include tea eggs and glutinous rice. Yee Fatt gets jam-packed during weekends and public holidays you’ll need to wait – we’d waited for 30 minutes at one time. Perhaps that’s the reason why the curry noodles have no decorations at all to speed up the serving process. Address : 39 Jalan Kampar, 31650 Ipoh, Perak. 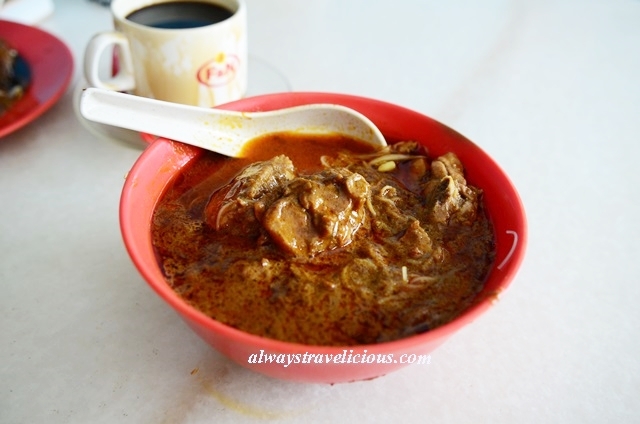 Didn’t know about this, If there is a time, will visit this Yee Fat Curry Mee. 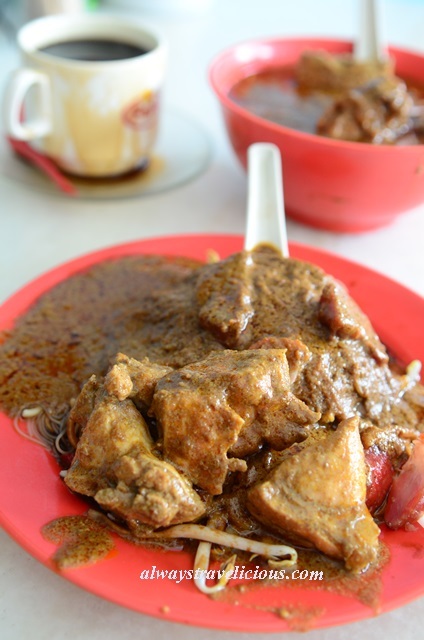 Pingback: 15 Iconic Ipoh Foods You Must Try in Ipoh - Always Travelicious !